Home > Entertainment > Mean Girls on Broadway: Is it fetch? Mean Girls on Broadway: Is it fetch? It’s hard not to laugh out loud while watching the drama-filled story of a high school clique in the Broadway musical Mean Girls. Mean Girls the movie, written by comic genius Tina Fey, aired in 2004. It opened on Broadway in early April 2018. 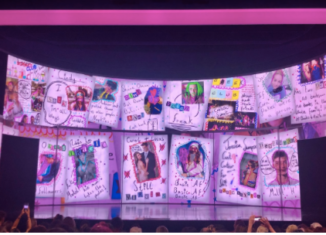 Before the Broadway show even started, the audience watched a slideshow of annotated yearbook photos on the screen, representing part of the clique’s “burn book.” This was one of many ways “the plastics” belittled their classmates. Comments ranged from bad to worse, including things like “made out with a hot dog” and “a sad old drug pusher.” Before one of the “mean girls” stepped foot on the stage, we already viewed them as selfish, insulting, and disrespectful brats. The story opens with main character, Cady Heron, as she makes a huge adjustment, moving from Kenya to Chicago. She goes from being home-schooled by her parents to the crazy environment of a public high school in a big city. Cady becomes friends with two individuals who don’t quite fit in with the rest of the school, and they take her under their wing. As soon as the plastics take an interest in Cady, they use her to find out the inside scoop on each of the plastics in an attempt to destroy their friendship and take away all the power that these three girls hold. Cady forgets her job as a “spy,” and she is willing to be friends with anyone that speaks to her. Coming out of the African jungle, she is looking for anyone who can help her navigate her way in the high school jungle. Many of the classic moments and quotes from the Mean Girls movie were carried over to the Broadway stage. The combination of the movie storyline, along with new aspects to entertain the 2018 audience, are skillfully intertwined. Classic lines like, “you can’t sit with us,” “you go, Glen Coco,” and “on Wednesdays we wear pink” are recited word-for-word from the movie and still brings the laughs fourteen years later. The one part of Mean Girls that could have been improved was the length. The show was very long and, at times, very predictable. While there is a 15-minute intermission, if the show’s total length was cut down by 10 minutes in both acts, it would have made it more enjoyable. Besides just the hilarious storyline, the choreography and music of Mean Girls are notable as well. All of the lead characters had outstanding voices and sensational acting skills. Mean Girls does not aspire to be an instant Broadway classic on the level of Hamilton or Dear Evan Hansen, but it is truly a mirthful crowd-pleaser. Overall, if you go see Mean Girls, you are sure to have, in the words of iconic mean girl Gretchen, a “fetch” night.